The reasoning behind the sacking of Japan’s Bosnian coach seems to be centered on Hallhodzic not seeing eye to eye with Keisuke Honda and Shinji Kagawa. In an interview with Japanese broadcaster NHK, Honda stated that he had become frustrated with Halilhodzic’s rigid tactics. Honda said he doesn’t have any regrets over the change of manager, and to submit to the kind of football that Halilhodzic wanted Japan to play would be shameful for him. He also pointed out that he is proud that he stayed true to himself and what he couldn’t accept was the chance he might be dropped from the World cup squad. 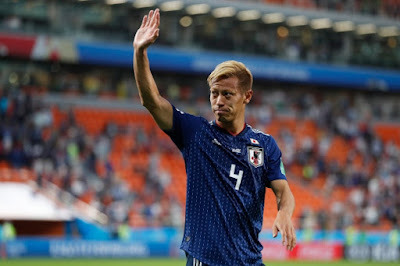 Meanwhile in the same interview Honda has said that he hasn’t forgotten that he promised the Japanese people that Japan will win the World Cup, and this is a big part of the reason why he must go – so Japan can see how much he will be fighting to make that bold statement become a reality. Reading Honda’s statements gives us the biggest insight yet that he was a major factor in Halilhodzic lose his job so close to the World Cup. In my opinion it had likely been made aware from Halilhodzic that he was at least thinking of not taking Honda and Kagawa to the finals in Russia next month. As Honda and Kagawa are two of Japan’s best known players globally it likely caused a big stir at the Japanese Football Association (JFA). In Japan, Honda and Kagawa will be able to pull in big sponsorship deals for the JFA, but in foreign countries they’re likely to be their two promotable assets going into the World Cup, especially in countries where they are playing their club football. To not select them in the World Cup squad must have been unthinkable for the JFA, even if you accept the JFA’s reasoning that poor friendly results were the cause of Halilhodzic’s dismissal as implausible as it sounds; it’s more likely that a Hondaless and Kagwaless Japan at the World Cup finals was the key reason behind Halilhodzic’s sacking.